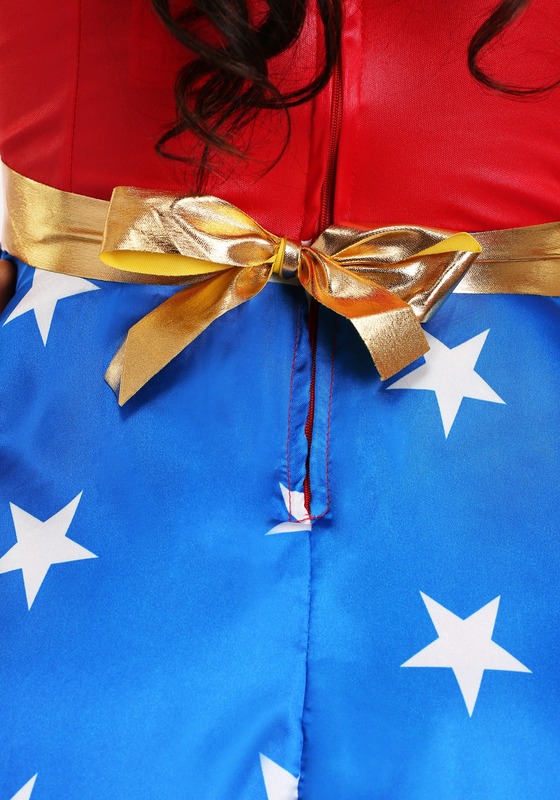 A superhero's uniform has to be as functional as it is recognizable! No matter how well known a hero may be for their huge sweeping cape or their enormous epic helmet or whatever, it's not going to be very helpful if they keep tripping on it or getting caught in automatic doors. 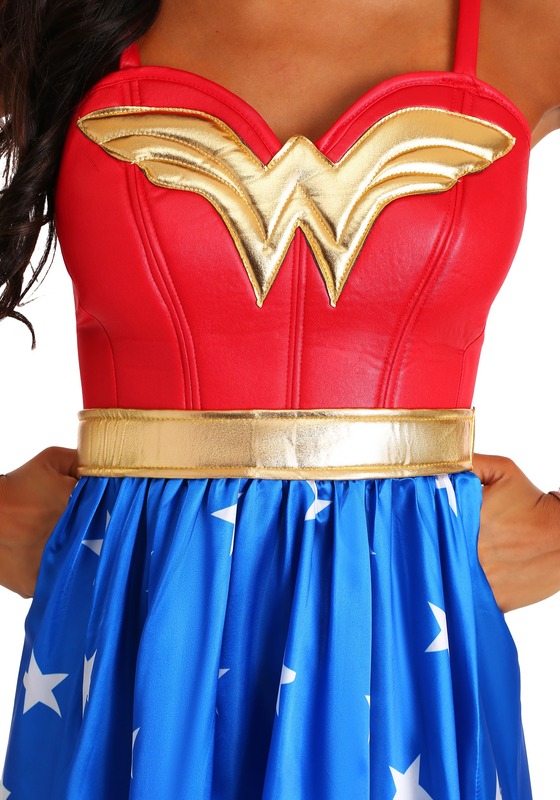 Take Wonder Woman for example. 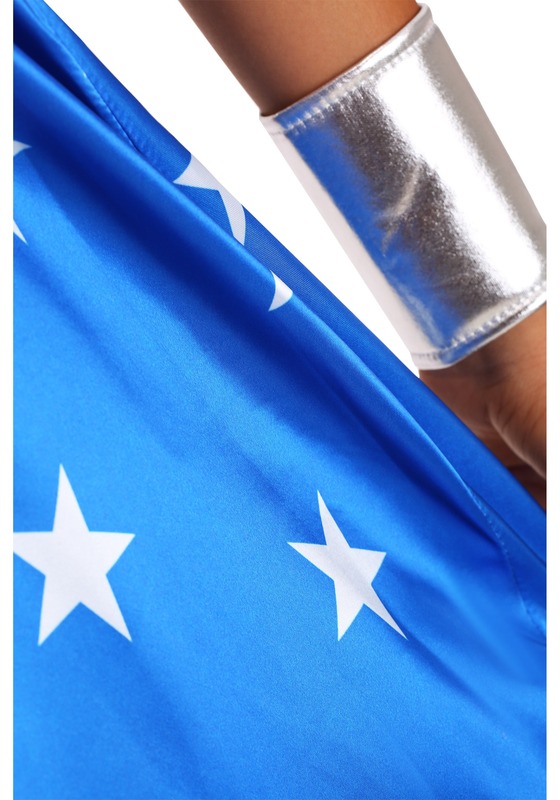 She is a very hands-on fighter and her iconic armor reflects that by allowing her freedom to move around quickly and she doesn't have to worry about any billowy capes or skirts getting in her way. But when she's not on the clock, her full battle armor isn't always necessary and she likes wearing something a bit more casual when letting her hair down. State dinners and holiday parties with other superheroes are a lot more tolerable if you aren't wearing form-fitting armor, after all! 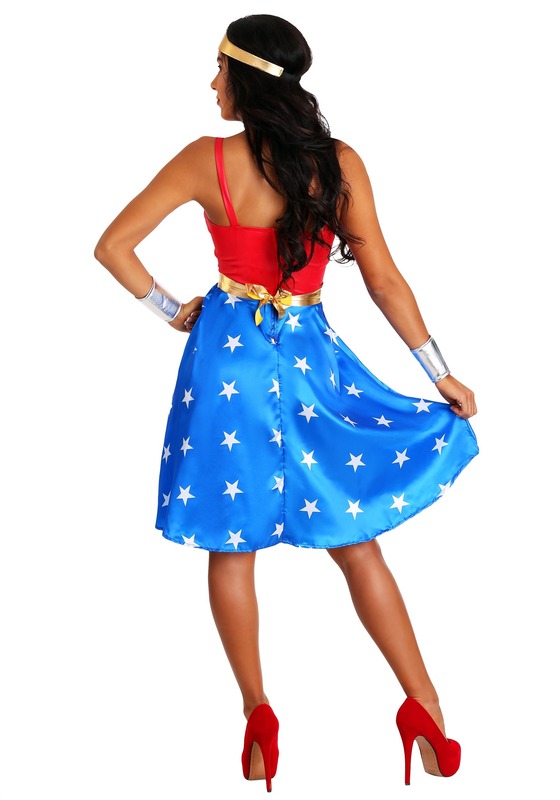 Enjoy a night off from fighting supervillains in style with this Adult Deluxe Long Dress Wonder Woman Costume. 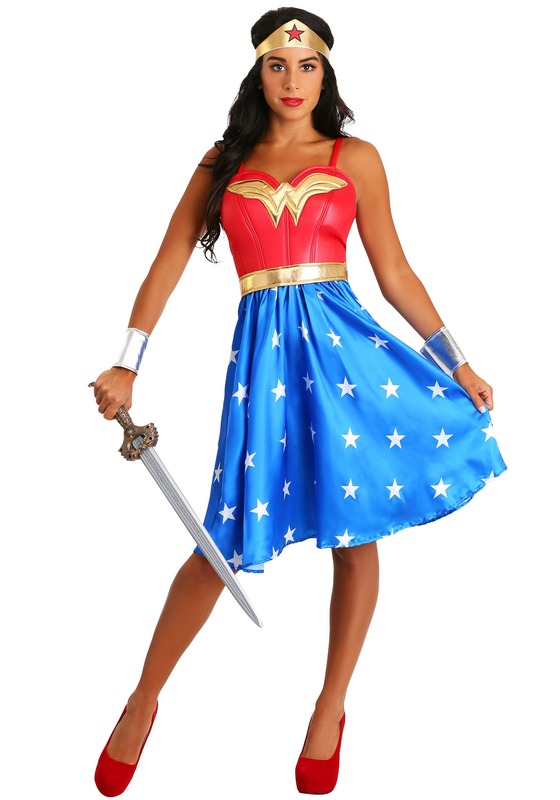 As a different take on Wonder Woman's classic Amazonian battle armor, this dress incorporates the familiar red top and gold stylized emblem and replaces the usual swimsuit style bottom with a cute and casual blue star patterned skirt. 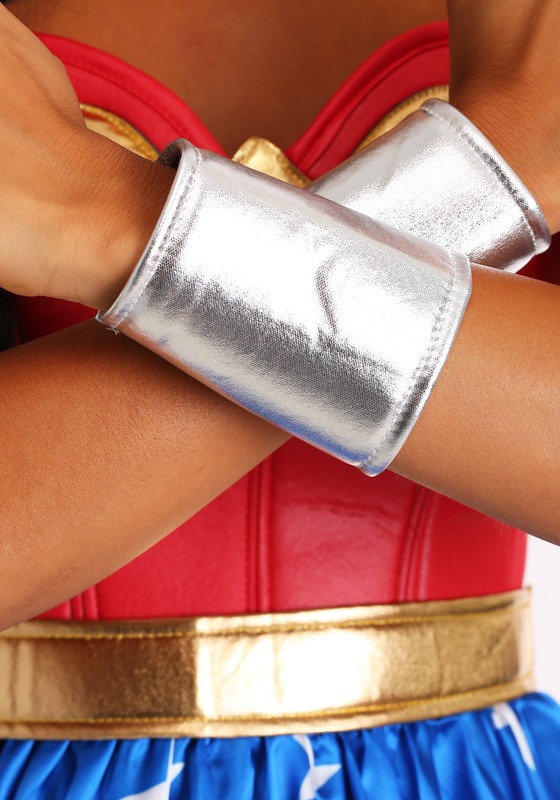 Complete the look with the included matching gauntlets and headpiece so you will still be prepared if trouble crashes your party. 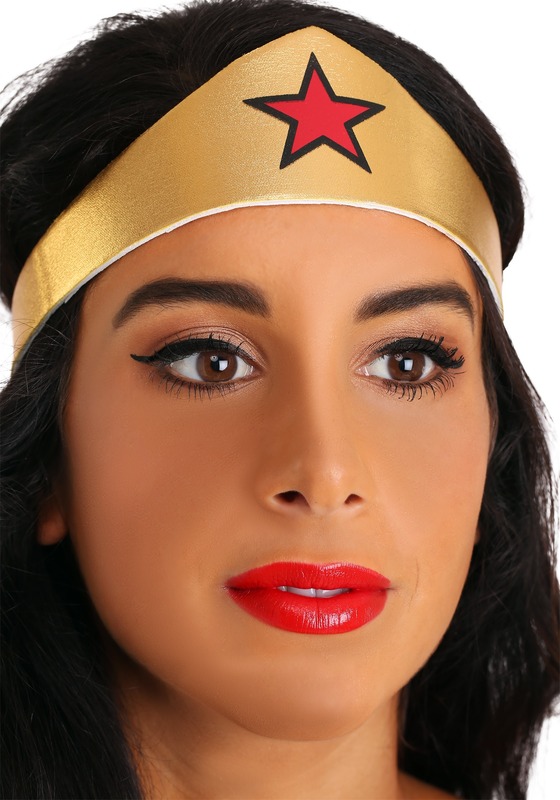 This costume is great as part of a superhero-themed group costume, or if you just feel like sporting a casually heroic look of your own! 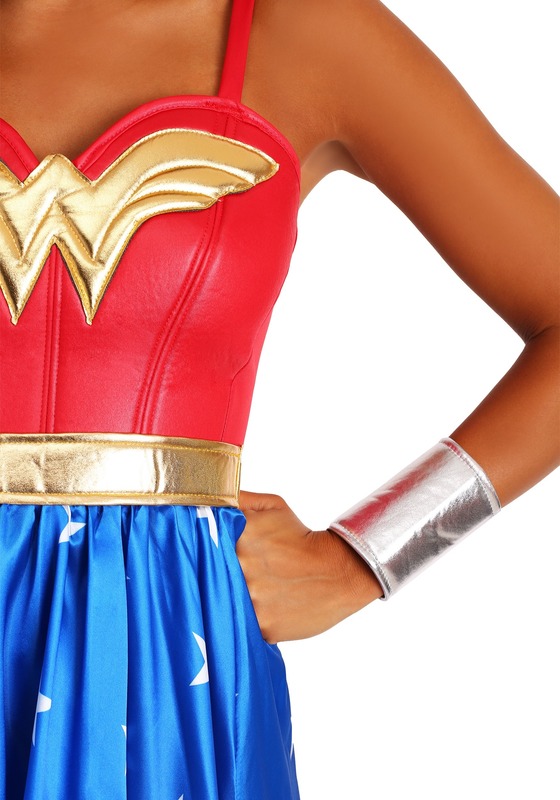 So whether you're taking on dignitaries, a children's superhero party, or an awesome Halloween soiree, you'll be ready to take on both the fun and the challenges. Dancing is a blast in the full skirt. Jumping up to grab mischevious little Billie before he raids the dessert table is no problem either, you've got room to move. So, throw on this ensemble and go get 'em!